U.S.-sanctioned Abdallah al-Muhaysini is a senior leader in al-Qaeda’s Syrian-based Nusra Front, having served at various times as a recruiter, fundraiser, and religious advisor for the terrorist group.“Treasury Designates Key Al-Nusrah Front Leaders,” U.S. Department of the Treasury, November 10, 2016, https://www.treasury.gov/press-center/press-releases/Pages/jl0605.aspx. Muhaysini has raised millions of dollars for the Nusra Front, boasting of having raised at least $5 million through a variety of terrorist fronts. In April 2016, Muhaysini launched a campaign to recruit 3,000 child and teenage soldiers from across northern Syria. In addition to fundraising and recruiting on behalf of the Nusra Front, Muhaysini has also served at various times as its military strategist and political representative.“Treasury Designates Key Al-Nusrah Front Leaders,” U.S. Department of the Treasury, November 10, 2016, https://www.treasury.gov/press-center/press-releases/Pages/jl0605.aspx. Muhaysini was born in 1987 in the Qassim region of north-central Saudi Arabia. After having reportedly memorized the Quran by the age of 15, Muhaysini graduated from the University of Umm al-Qura in Mecca with a degree in sharia (Islamic law).Aaron Y. Zelin, “The Saudi Foreign Fighter Presence in Syria,” Combatting Terrorism Center at West Point, April 28, 2014, https://www.ctc.usma.edu/posts/the-saudi-foreign-fighter-presence-in-syria. Muhaysini earned his doctorate degree soon after from the Imam Muhammad ibn Saud Islamic University in Riyadh, where he studied under extremist, al-Qaeda-affiliated propagandist Sulayman al-Ulwan. After serving as the imam at the Qatar mosque in Mecca, Muhaysini left for Syria in or around 2013, where he quickly took up with the Nusra Front. He was photographed alongside notorious Chechen Nusra commander Omar al-Shishani, and has admitted to having spoken with al-Qaeda leader Ayman al-Zawahiri by phone.Aaron Y. Zelin, “The Saudi Foreign Fighter Presence in Syria,” Combatting Terrorism Center at West Point, April 28, 2014, https://www.ctc.usma.edu/posts/the-saudi-foreign-fighter-presence-in-syria. Before he became the target of U.S. sanctions in November 2016, Muhaysini maintained an English-language Twitter account under the handle @Muhaysini_EN, where Muhaysini—despite his affiliation with the Nusra Front—claimed to be an “immigrant to Shaam [Syria]” and “an independent student of knowledge who doesn’t belong to any [rebel] faction.”Thomas Joscelyn, “US Treasury designates Saudi jihadist cleric, three others in Syria,” Long War Journal, November 10, 2016, http://www.longwarjournal.org/archives/2016/11/us-treasury-designates-saudi-jihadist-cleric-three-others-in-syria.php. 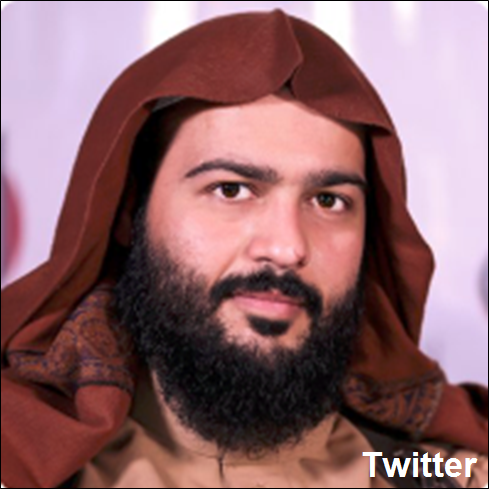 Before finally being suspended in November 2016, Muhaysini’s Twitter account had reached more than 60,000 followers.Rukmini Callimachi, “Protest of U.S. Terror Listing Offers a Glimpse at Qaeda Strategy,” New York Times, November 17, 2016, https://www.nytimes.com/2016/11/18/world/middleeast/protest-of-us-terror-listing-offers-a-glimpse-at-qaeda-strategy.html. Muhaysini was sanctioned by the U.S. government for his role in the Nusra Front on November 10, 2016.“Treasury Designates Key Al-Nusrah Front Leaders,” U.S. Department of the Treasury, November 10, 2016, https://www.treasury.gov/press-center/press-releases/Pages/jl0605.aspx. In an interview with the New York Times released the following week, Muhaysini denied any affiliation with al-Qaeda and claimed that Syrians were outraged at the designation since he was a “national symbol” for the Syrian people. As the Times reports, however, Muhaysini has used his social media profile to eulogize deceased al-Qaeda leaders and encourage suicide bombers to carry out attacks. As the Times notes, Muhaysini was even profiled in one of al-Qaeda’s magazines, Al Risalah.Rukmini Callimachi, “Protest of U.S. Terror Listing Offers a Glimpse at Qaeda Strategy,” New York Times, November 17, 2016, https://www.nytimes.com/2016/11/18/world/middleeast/protest-of-us-terror-listing-offers-a-glimpse-at-qaeda-strategy.html. In September 2017, Muhaysini announced his resignation from Hay’at Tahrir al Sham (HTS), a group formed from a merger of al-Nusra Front and several smaller groups. He complained about the infighting between HTS and Ahrar al-Sham and leaked audio recordings that exposed that some within HTS had it out for him, citing these as the reasons for his resignation.Thomas Joscelyn, “Al Qaeda again addresses factional infighting in Syria,” Long war Journal, March 24, 2018, https://www.longwarjournal.org/archives/2018/03/al-qaeda-again-addresses-factional-infighting-in-syria.php. He has also survived two assassination attempts. The first by a suicide bomber in June 2017 left him unharmed and the second in April 2018 by a road side bomb wounded him.Angus McDowall, “Militant Saudi cleric survives assassination attempt in Syria,” Reuters, June 16, 2017, https://www.reuters.com/article/us-mideast-crisis-syria-assassination/militant-saudi-cleric-survives-assassination-attempt-in-syria-idUSKBN1972AJ; “Abdullah Al-Muhaysini Wounded in Assassination Attempt in Syria's Idlib,” Fars News Agency, April 28, 2018, http://en.farsnews.com/newstext.aspx?nn=13970208000469. ‘Abdallah Muhammad Bin-Sulayman al-Muhaysini“Alphabetical Listing of Specially Designated Nationals and Blocked Persons (‘SDN List’),” U.S. Department of the Treasury, accessed February 14, 2017, https://www.treasury.gov/ofac/downloads/sdnlist.txt. Abdallah Muhammad Bin-Sulayman al-Muhaysini“Treasury Designates Key Al-Nusrah Front Leaders,” U.S. Department of the Treasury, November 10, 2016, https://www.treasury.gov/press-center/press-releases/Pages/jl0605.aspx. Abdullah alMuhaysini“Alphabetical Listing of Specially Designated Nationals and Blocked Persons (‘SDN List’),” U.S. Department of the Treasury, accessed February 14, 2017, https://www.treasury.gov/ofac/downloads/sdnlist.txt. ‘Abd Allah bin Muhammad bin Sulayman al-MuhaysiniAaron Y. Zelin, “The Saudi Foreign Fighter Presence in Syria,” Combatting Terrorism Center at West Point, April 28, 2014, https://www.ctc.usma.edu/posts/the-saudi-foreign-fighter-presence-in-syria. Sheikh al-MuhaysiniThomas Joscelyn, “US Treasury designates Saudi jihadist cleric, three others in Syria,” Long War Journal, November 10, 2016, http://www.longwarjournal.org/archives/2016/11/us-treasury-designates-saudi-jihadist-cleric-three-others-in-syria.php. @Muhaysini_ENThomas Joscelyn, “US Treasury designates Saudi jihadist cleric, three others in Syria,” Long War Journal, November 10, 2016, http://www.longwarjournal.org/archives/2016/11/us-treasury-designates-saudi-jihadist-cleric-three-others-in-syria.php. On November 10, 2016 Abdallah Muhammad Bin-Sulayman al-Muhaysini was designated under Executive Order 13224 for providing support and services to al-Nusrah Front.“Treasury Designates Key Al-Nusrah Front Leaders,” U.S. Department of the Treasury, November 10, 2016, https://www.treasury.gov/press-center/press-releases/Pages/jl0605.aspx. U.S.-sanctioned Abdallah al-Muhaysini is a senior leader in al-Qaeda’s Syrian-based Nusra Front.